Moscow is one of the greenest megacities in the world with more than fifty spots to enjoy the autumn nature. If you are lucky enough to be in Moscow, here are some of the most beautiful amongst them. An autumn selfie or just a pretty picture on Instagram is guaranteed to all visitors – there is free access to Wi-Fi on the park grounds and there are stands for recharging notebooks and cellphones. Gorky Park has a wide range of interesting sculptures for taking pictures such as, the park’s symbol, the legendary “Girl with an Oar” sculpture. With dancing right on the banks of the Moscow River and leaves falling from overhead, the park is a special place to enjoy the changing of the seasons. 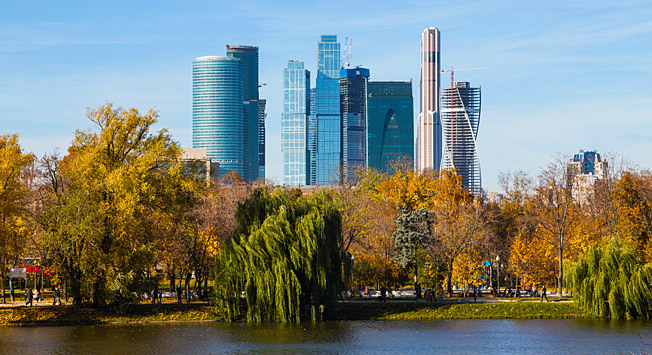 Gorky Park is connected by walking and cycling paths right the way to Sparrow Hills, where from up on the high banks of the river there is a spectacular panoramic of Moscow. The cable car which ascends the bank is a great way to view the autumn colours of the trees below. The old Dyakovsky, Kazansky, and Voznesensky orchards are true symbols of Kolomenskoye. Located at the highest point of the park, the orchards afford visitors wonderful views of the Moscow River in its autumn setting. Away from the busy boulevards, here you can taste the scent of apples and decaying foliage, a rare pleasure in today’s Moscow. There is no place in the whole city quite so tranquil or serene than the apple orchards of Kolomenskoye Park. Take some friends, a blanket, and a picnic basket and you could forget you were in one of the biggest cities in the world. In Kolomenskoye, there are various places to enjoy enjoy the autumn view of the capital (Hint: Use the free panoramic binoculars at the Vozneseniya Square). This park is the best place for autumn hiking right within the city limits. Izmailovsky Park, unlike the rest of Moscow's parks and estates, is rather untamed, and so feels like a wild forest with tree branches and old stumps covered in moss. Enjoy the crinkle of fallen leaves under foot or gather a beautiful bouquet of autumn foliage. The Izmailovsky Park grounds cover more than 700 acres, so if you want to see the whole park renting a bike is the best option. Or, to get an idea of the grand scale of the park, take a ride on the ferris wheel. Tsaritsyno is the only English landscape park in Moscow. This park kingdom has a unique color scheme, combining red brick with white stone ornaments. Pseudo-Gothic palaces, pavilions, arches, and lacework bridges appear magnificent set against the backdrop of the autumn landscape. The cascade of ponds reflects the surrounding beauty. In autumn when the nights draw in, at Tsaritsyno you can look and listen to the light and music fountain on Horseshoe Island in Tsaritsyno Pond, late into the evening. The French formal garden decorated with genuine marble sculptures of mythological characters, as well as a preserved summer palace with authentic interiors and porcelain collections, makes this estate unique. There are few grander places in Moscow for admiring the autumn landscape. Get out here on the weekend in early autumn when the trees and shrubs on the site are painted in the spectrum colors of nature. The pearl of the Botanical Garden is the Japanese garden carefully arranged in accordance with all of the conventions of the Japanese national landscape art. Come here to enjoy solitary contemplation of autumn nature. It also creates the ideal opportunity to practice Momijigari, the traditional Japanese custom of admiring maples: The autumn colors brought here specially by the Manchurian maples, gingkoes, spindles, and chestnuts together with the blue sky is extraordinarily beautiful when reflected in the garden ponds full of floating fallen leaves. In the center of the garden composition is a stone pagoda imported from Japan which symbolizes a Buddhist temple, and tea ceremonies are occasionally held in the Azumaya teahouse.